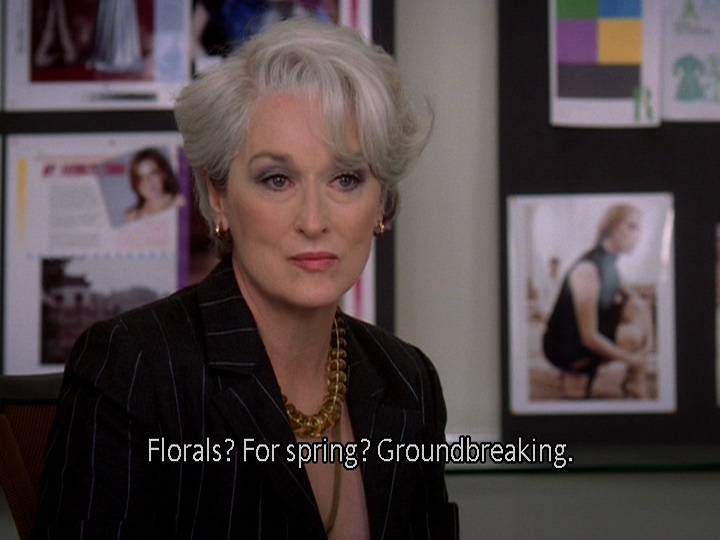 Rather than a ‘spirit animal’ I have a spiritual affinity with Miranda Priestly; the iciest of all editors from the movie The Devil Wears Prada. The sass and style of that woman is incredible and no one quite sums up my attitude towards spring/summer trends like the character herself. And she’s right. What is ground breaking about a trend that is recycled year in, year out? Why must we become the physical manifestation of the blossoming flowers around us? With the arrival of autumn we don’t don shades of orange and yellow to represent the falling leaves, so why must we mirror the season of spring? These are questions I ask myself each year when I find myself skimming through racks of candy coloured clothing, pastel shirts and white, lacy dresses. I love white summer dresses I do, but if I am honest with myself, they don’t love me back. For I am what you might, rather optimistically, describe as an ‘English Rose’; a pale, freckly, easily sunburnt kind of girl. Imagine that beautiful combination in a white dress and you can understand my fear of resembling a speckled milk bottle. If my twenty years have taught me anything, it is to ultimately ignore what the high-street dictates you should be wearing and rather, find clothes you are not only happy wearing but that are comfortable in the heat too. Summer style doesn’t have to be synonymous with pastels and floral and for me it has come to mean white jeans and an open shirt, leggings and a kimono, a simple vest and maxi skirt; solutions that ensure I don’t have to expose every limb in order to look seasonal. In fact the seventies was a huge inspiration on the catwalk this season and whist that is typically interpreted as white, crochet, thigh skimming dresses, I will be interpreting that to mean flares and suede. Though skinny jeans are positively sweaty in the summer heat, flared trousers provide your body with more room to breathe and the good news about the summer is that the dry weather ensures your suede will stay in good form. Whether you opt for a pair of suede shoes or a suede jacket for summer evenings, the material is perfect for providing an effortlessly retro look in any colour; pastels not necessary! As for the repetitive floral patterns that crop up every year, I will be sticking to a plain white peasant blouse thank you very much. Dead on trend, the peasant blouse is the seventies take on a simple white shirt. Off the shoulder, sleeves or no sleeves, there is a peasant blouse for everyone. Made typically from embroidered cotton, this lightweight blouse is ideal in the heat and provides a perfect cover up on the beach or paired with flared jeans. If flares aren’t your thing and, like me, you won’t touch a miniskirt without a tan, perhaps culottes are the answer to your prayers. Perfect for the non-committal, culottes expose no more than a little ankle, meaning you don’t even have to shave your legs if you don’t want to! Though there are many designs on the high street in garish floral patterns, with a little searching there are also plenty of designs in block colour. This summer, in honour of Miranda Priestly, I will be steering clear of all things floral and instead, opting for clothes that suit me. Clothes that perhaps really truly are ‘ground breaking’ and clothes I can continue to wear even when the leaves begin to fall. Next articleA New Image for Abercrombie?